Amazing Escapology Acts Available to book for your events. David is widely regarded as one of the most exciting escapologists and sideshow artists performing in the world today, he is a truly international performer. In 2006/7 he was booked to perform on 5 continents. Performing on stages large and small in a variety of countries, including America, Russia, Korea, Dubai (for the 2007 shopping festival), China, Ireland and of course mainland Europe. In many cases being booked to return for a second and even a third time. His shows include sword swallowing (David is one of only around 50 performing sword swallowers in the world), amazing sideshow routines such as the human blockhead and bed of glass. Of course the highlight of any show is always a demonstration of the incredible escape skills which have brought him a total of eight Guinness World Records, and led Ripleys Believe It Or Not to dub him;The Modern Houdini"
Other services include personal training and advice for TV, movies etc. David recently trained Ant & Dec for their show 'Saturday Night Takeaway' and provided expert advice for 'Big Brother 7'. 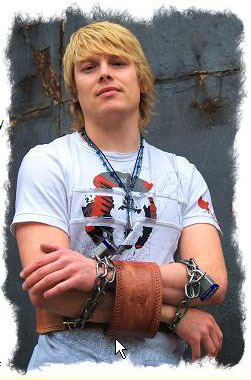 He can also perform sideshow stunts, escapology and fire skills for walkabout, photographic work, TV, movies etc. Solo cabaret/festival shows: up to two thirty minute, or three twenty minute shows per day. Solo spots: i.e. sword swallowing, fire eating podium spots as required. Stunts and skilled performed include: Sword Swallowing, Straitjacket Escapes, Handcuff Escapes, Rope Escapes, The Human Blockhead, Bed of Glass, Mental Flossing, Fire Eating (in suitable venues) and more. Arena stunts such as suspended straitjacket escapes can also be arranged. "Just a word of thanks and appreciation to you both for your work at the Gala. that they really engoyed your performances, as did a lot of the adults too!" " I would like to thank you very much for arranging the acro balance duo for our Children's Gala. They were a huge success. Thanks again for all your help. " "We really enjoyed your visit, the kids have talked about nothing else since. Thanks for your energy, enthusiasm and encouragement. It really was a day they will cherish in their memories well past their time here at Heathyryburn. "Hi Eric - many thanks. As usual the performers went down a storm and we received great feedback from the crowd. Thanks again"
Thank you foryour services for the above event. The event was a huge success and 'Sparky' did a remarkable job. He is very good at pulling in children to this stall which kept him busy all day. Please pass my kind regards on to him and hopefully look forward to seeing him again next year! held in Buckhaven Community Centre on Saturday 23rd May 2009.
for further opportunities and related developments. The planning group wish to extend thanks to you for your contribution on the day." URBAN CIRCUS FOR MANY A JOB WELL DONE NOTHING IS TO MUCH TROUBLE FOR THIS AMAZING TROUPE." "Thought I would drop you a line to say thank you very much, Emma, Phil and Steven were all terrific and the feedback from members of the public was very good."